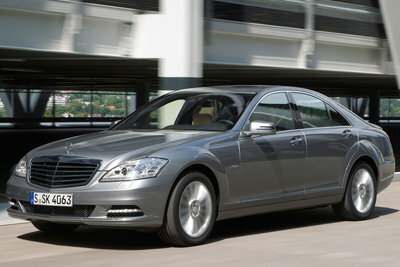 The Mercedes-Benz S-Class is an icon for the Mercedes brand and serves as a benchmark for all other large luxury sedans. The model range is vast, with models ranging in price from $92,000 to over $210,000. The S-Class is a handsomely styled vehicle with a complex combination of smooth and angular surfaces. Interior trim materials include wood, chrome, leather, and aluminum. The S-Class is packed with technology and safety features including a radar-based cruise control, and active infrared night vision system. In this small but visible segment, buyers can also shop the sporty BMW 7-Series, the understated Audi A8, or the utterly reliable Lexus LS 460. With a huge price spread, the S-Class also competes at the top end with vehicles like the Maserati Quattroporte and Bentley Flying Spur. Standard equipment changes on S350 BlueTEC 4MATIC, S400 HYBRID & S550 models.